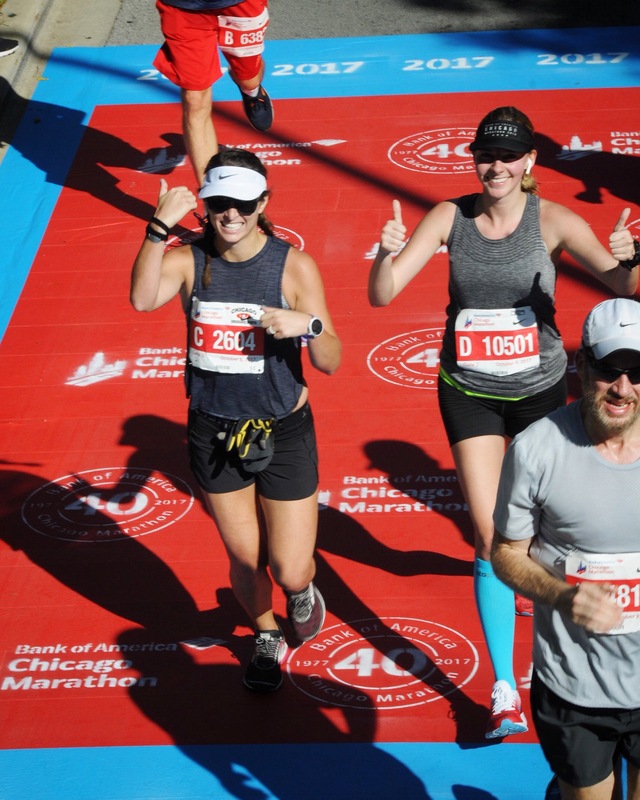 I went into this Chicago Marathon with no real expecations. I wanted to have fun and soak in the energy from the crowd. I wanted to cross the finish line feeling strong. And I wanted to celebrate running my 7th marathon and 3rd Chicago. I knew it would be tough to run two marathons in one month, especially after running a 3:30:54 at my Last Chance to BQ in Grand Rapids. That’s why I didn’t put any pressure on myself. And guess what? It worked. But I’ll get to that later. 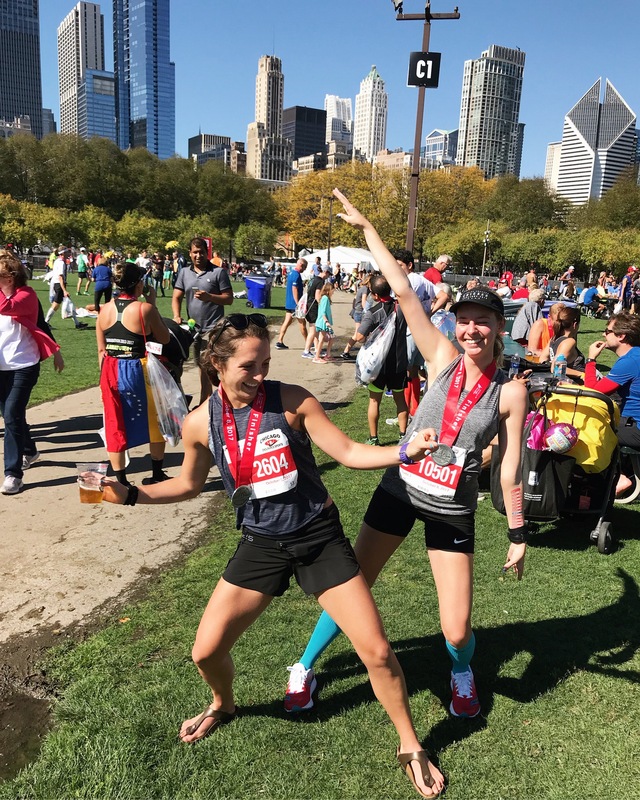 My friend Cait asked me to run with her and I was hesitant at first because I know how hard it is to really stick with someone for a whole marathon and I feared I would hold her back. I knew she wanted to BQ and while I usually have faith in my pacing abilities, I didn’t know how much speed my legs would have in them. I told her yes. I wanted the company. But I also said if I couldn’t hold 8 minute miles that she should ditch me. I really had my doubts. 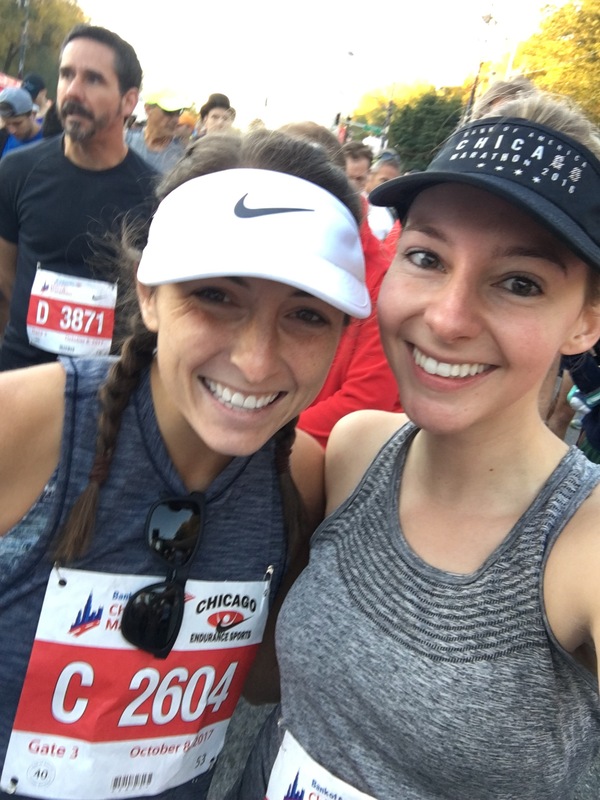 We took the train together, went to the race resort, made a friend who rebraided Cait’s hair, nervously waited in line to not have to pee for the third time, and then walked to the start line. We were surprisingly calm. All I wanted was to show I was calm and keep Cait calm even though I was nervous about not being able to have another strong race. We went over our plan, agreed to take the first few miles slower and then try to hold steady 8 minute miles until the end when we’d give it one last surge. We crossed the start line. I always have to remind myself not to trust the first mile of any run or any race and today was no different. I really didn’t feel great. My recent memories of miles 24-26.2 at Grand Rapids were fresh in my mind. The last couple miles are always rough, but what good was it going to do thinking about the end at mile one? My Garmin said we ran a 1:57 first mile. Lol. Obviously not right. I knew my watch would be messed up, but I didn’t think it would be THAT messed up. I was super thankful already to be wearing my 3:30 pace tattoo on my arm. Cait had to give me a bit of a pep talk around mile 6 because I wasn’t exactly smiling. I was still nervous. I was honestly nervous about safety. I felt more alert than usual. And I was nervous my legs just weren’t going to make it another 20 miles at our current pace. She told me I was strong. I listened. And I told myself that I just had to make it to the half way point and then I would have a strong second half. One mile at a time. One of Cait’s friends jumped in some point before the half and was like, “Do you guys know you’re running sub 8 minute miles?” She was super encouraging, but wanted to make sure we knew. I hadn’t really thought we were doing close to 7:50s, but we averaged 7:52 from the 10K mark to the 20K mark. We felt good. We didn’t talk much. We checked in when we needed to, but really focused on taking in the crowd. Seeing her husband and my boyfriend at mile 12 gave us a much needed boost approaching the second half. I accidentally picked up the pace a bit (or so Cait says) but we felt strong. We crossed the half marathon mark in 1:44:29 – exactly where we wanted to be. I told her all we had to do was the same exact 1:44:29 again and we’d have our BQ. We could do it. It was staring to get hotter, but to be honest I didn’t notice much. After running the Nashville Rock ‘n’ Roll Marathon in 90 degrees, no race really phases me. I guess it was a blessing. 70 degrees felt comfortable. I took my second GU around mile 14. I had been using chews for years, but recently made the switch to GU instead and found it much easier to get down. We grabbed water from every water stop, but never walked. I know walking through water stops works for a lot of people, but I’m just not into it. We had it down to grab cups separately, but meet back up once we were outside of the cluster of people. I was honestly pretty impressed with how quickly we fell back into sync each time. With each new mile I felt stronger and stronger. I knew I would have a better second half. I just had to convince myself I could do it again. We held a 7:56 average pace from the 25K to the 30K mark. At each mile marker I would look at the time on my watch, check my pace tattoo and tell Cait how many seconds we were under the 3:30 goal if we kept up our consistency. Besides the mile markers, I didn’t check my watch. I was SO much better about it during this race than I was during my Grand Rapids race. I knew compulsively checking my watch didn’t do me any good. I learned. And I applied my last race to this race. We had music on us, but wanted to wait until the end to put it to use. We saw Arielle around mile 18, then the boys again, and knew we could ride out that boost for a little bit longer. After mile 20 we decided to tune in. We each took one of Cait’s earbuds so we could listen to the same music and it worked out well. We really looked this happy at that point. Those last few miles are always tough. And we didn’t know what would happen. I was confident in our abilities. I truly thought we had our goal time, but you never want to get cocky. I felt 10 times better at mile 23 today than I did the month before. I didn’t have that aching “ugh my legs cannot move any faster” feeling. I felt like I was flying. We were. And we were almost there. Mile 24 came quickly. I felt like I blinked and we flew from 23 to 24. (This never happens to me). We weren’t talking. I offered one high five and said we had it. And that was that. We were FOCUSED. So focused. Mile 25. I felt good. I started to tear up. 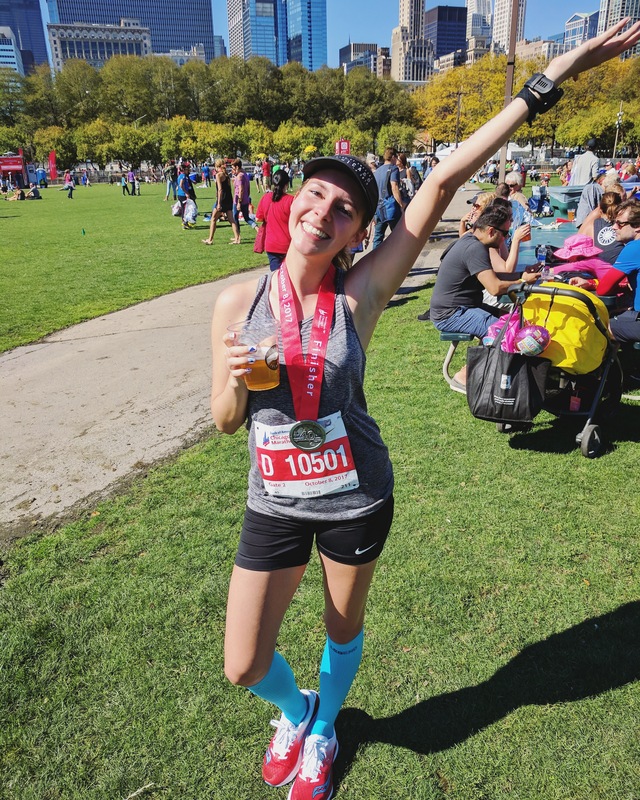 Marathon number 7 was coming to a close and it was my strongest, happiest race yet. I never hit the wall. I gained confidence as I went. I had Cait’s company. And I knew we were going to lock in our BQ’s for 2019. At the 800 meter mark I said out loud, “How many times have we run 800 meter repeats? We could do this in our sleep!” The look Cait gave me was hilarious. But she was still smiling and we were still together. We knew we had it. I closed in on the 400 meter mark and thought I saw Jennifer (@jbirdruns). I lightly tapped her on the arm, smiled, and said “Come on we’ve got this.” I questioned if I should tap her because I didn’t want to mess with her zone and we’ve never met in person, so I didn’t want to freak her out, but I know how nice it can be to have that support in the end. I’m glad I did. We raced in the last little part together and she got herself another BQ. We didn’t hug or catch up in the post-marathon chaos, but next time. It was a cool moment. Cait and I looked at each other right past that finish line and bust out crying. Happy tears. Proud tears. Marathoner tears. I was so stinking proud of her. A new 25+ minute personal record and she was so consistent and calm the entire race. I was crying out of pride for myself too. I set out to run this race for fun and that is exactly what I did. It just so happened to also be a new personal best. 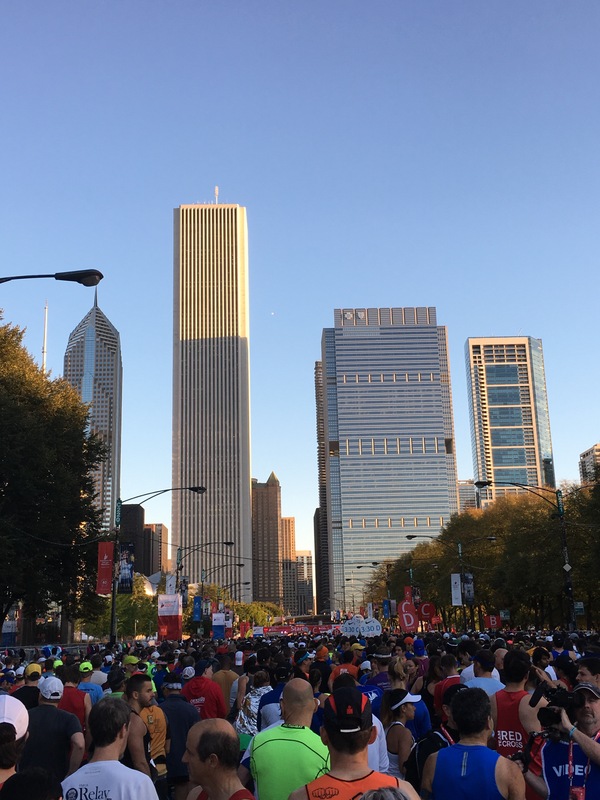 I am in love with the Chicago Marathon course. The energy of the crowd and the volunteers helped me run as strong of a race as I did. 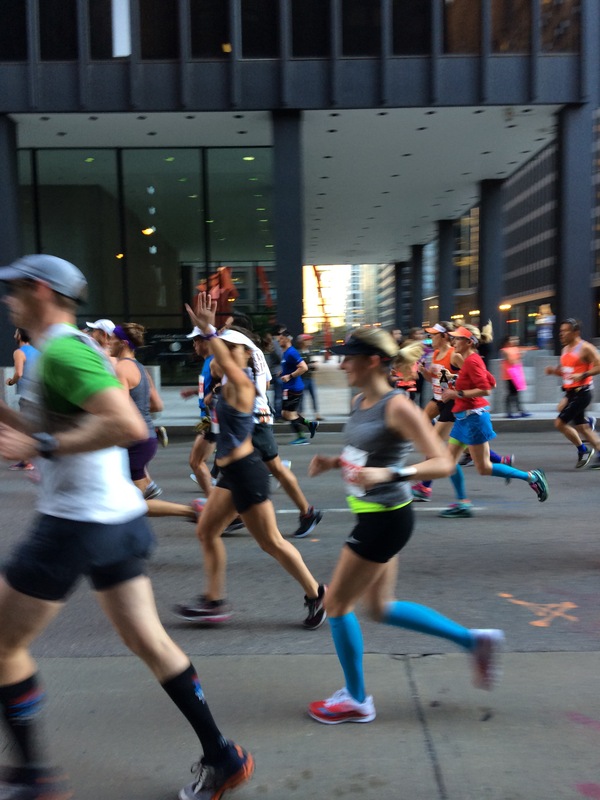 I was grateful for the extra security, the happiness the city seems to share, and the smiles of runners around me. I truly think I am happiest at that marathon finish line. We grabbed our beers. Cried some more. Hugged some more. And went to find our friends and family. Reuniting with people you love after such a big moment is unbeatable. I am incredibly blessed to have the best support system. I cherish seeing my people along the course and after that finish line. My support system helps make me the runner I am. 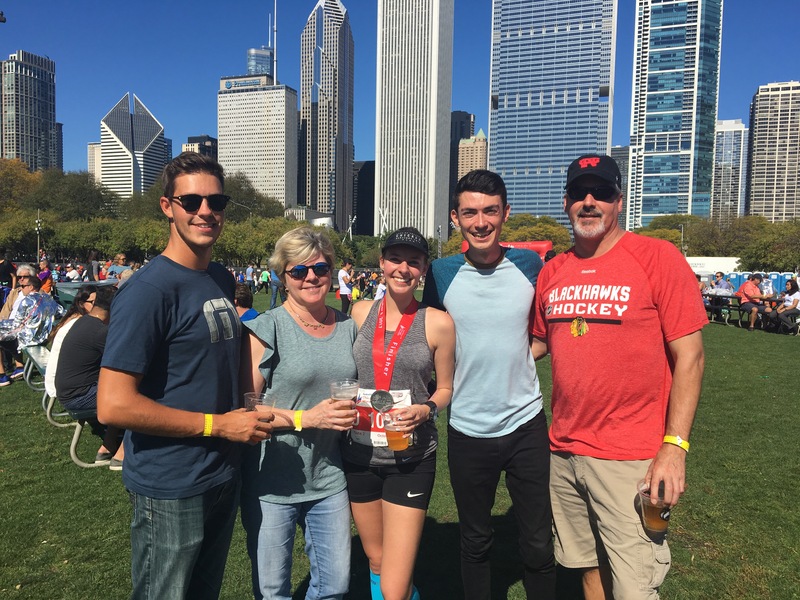 This Chicago Marathon was my third time running the course, but it was the best one yet. I take in new things each time. And learn from the race that day. This year, I learned I am strong as hell. I am capable. 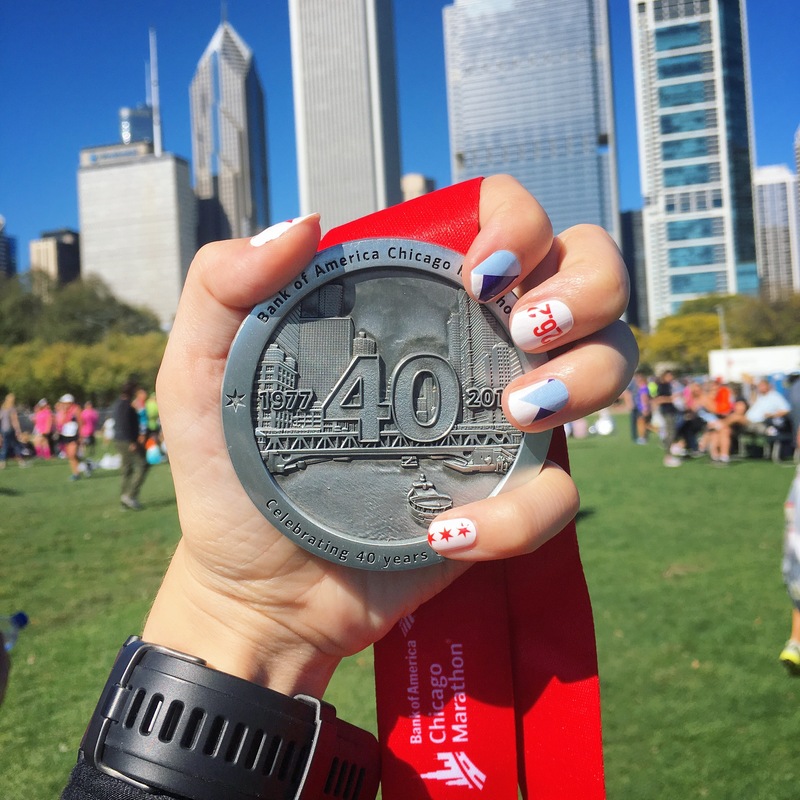 I love the city of Chicago and I love the marathon distance. I really did not know I had a 7:57 average pace marathon in me when we nervously crossed that start line in the morning, but I knew if I relaxed and focused on having fun, I would run well. And I did. I could not have asked for a better race. A lot of hard work and a little faith goes a long way.